There’s something downright uncomfortable about the proportions of a conventional bathtub, especially those built into older houses. They’re often too short and shallow for the average adult, so lounging is rarely easy. You’re either stuck sitting uncomfortably upright in a seated position or laying flat on your back with your legs hanging out of the water. Either way, half of your body is cold. 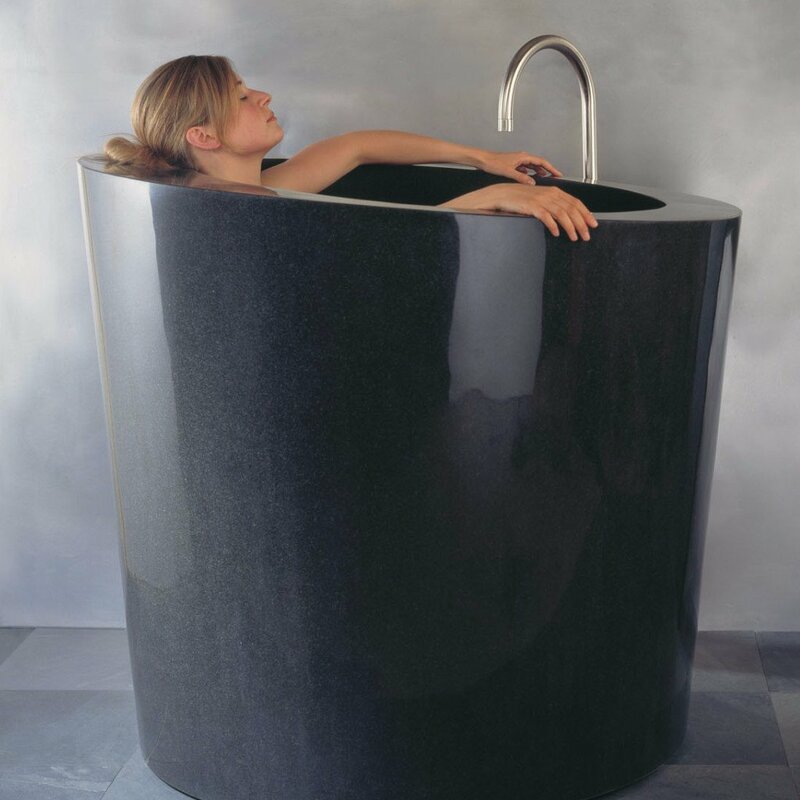 Why aren’t more tubs designed for adults to indulge in luxurious full-body soaks? 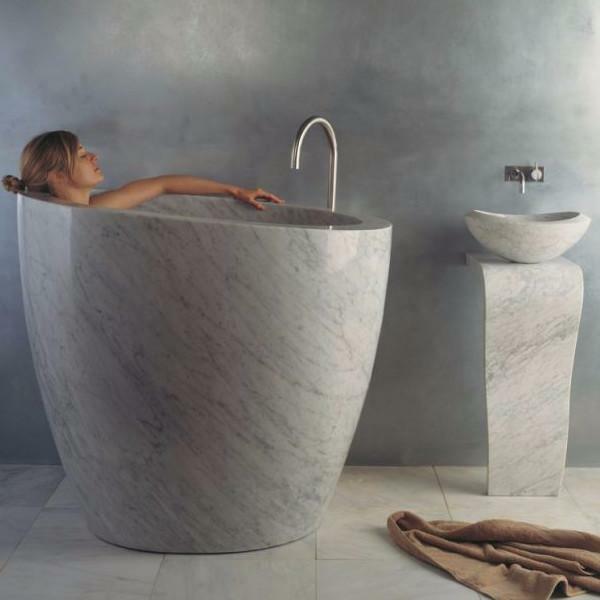 An innovative tub design by Stone Forest lets you take a dip in a vessel that’s shaped more like a cup than a bowl, with high sides and a built-in seat for a natural posture. Carved from a single block of granite or marble, each one is made to order and can be custom-shaped to your liking to suit your needs and sizes. Pictured here are the black granite Oval Soaking Tub and the white Carrara marble Eau Soaking Tub. In addition to being simple and well-designed from a material and color standpoint, this deep soaking tub accomodates the kind of lounging most of us only wish we could do in our own bathtubs. Best of all, this is a space-saving tub and eminently practical in even the most cramped of quarters – perfect for the urban dweller. At least, maybe it would be if it didn’t weigh 2400 pounds, necessitating a fairly sturdy floor. 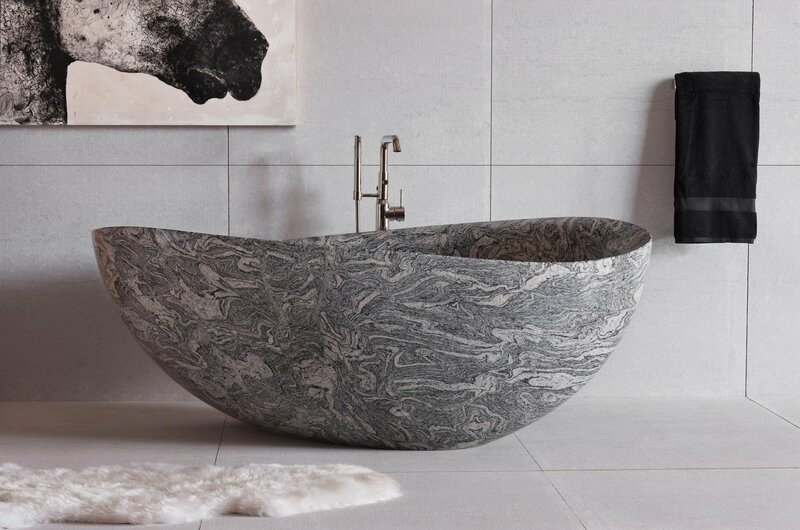 If you prefer a more reclined position, Stone Forest has heavy luxury tubs in that variety as well. 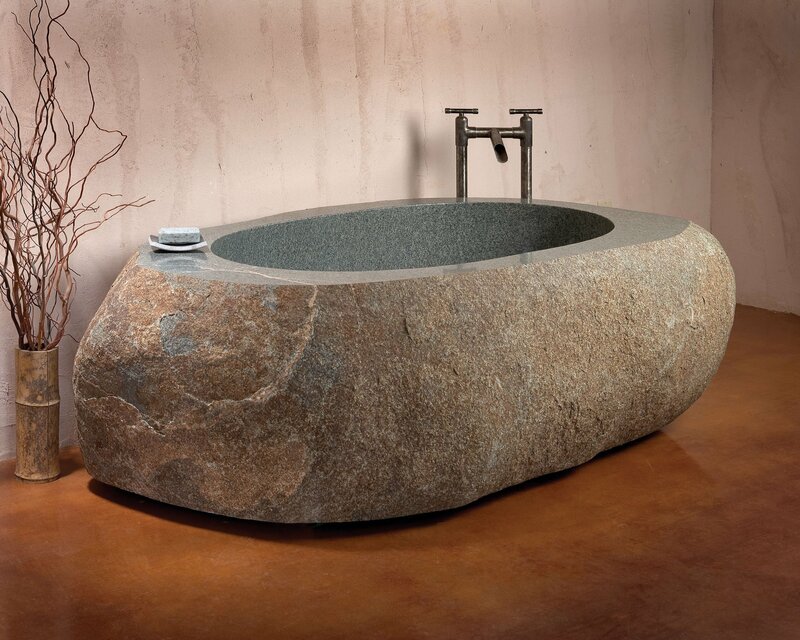 The Cumulo granite Papillon tub, elegant round stone bathtub and the striking “boulder” bathtub all allow for a little more freedom of movement, and can be made large enough to accommodate your full height. Naturally, you’re going to need plenty of hot water to fill these oversized bathing vessels, so an on-demand hot water heater is a nice accessory to add during installation.